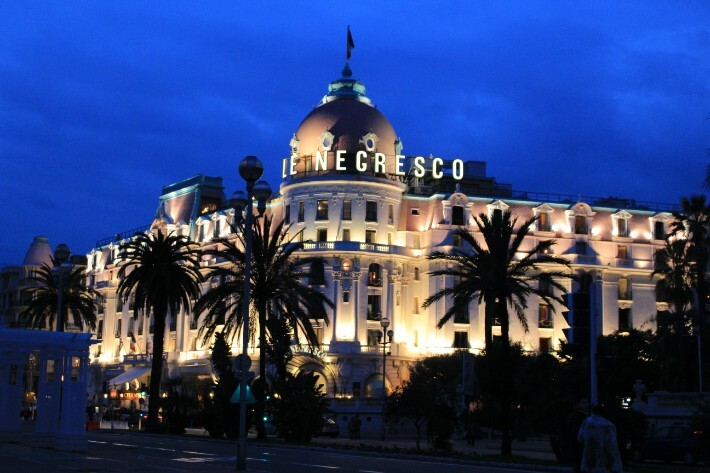 Things to do in Nice, France – Is It Worth Visiting? 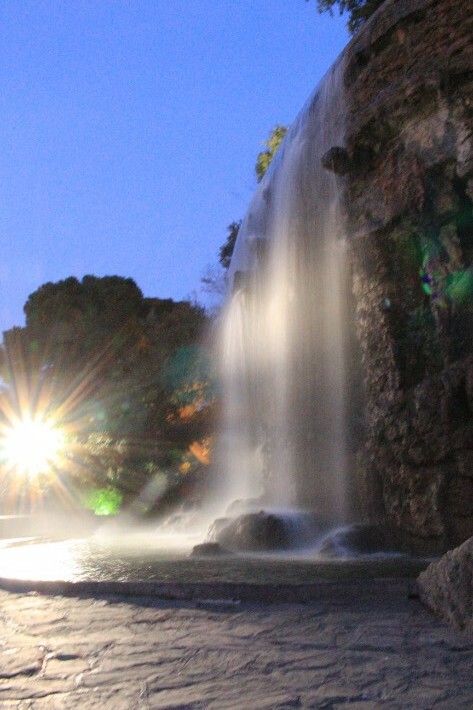 Home » Things to do in Nice, France – Is It Worth Visiting? Is Nice really that nice? (Pardon me, I’ve been dying to use this pun.) The picture-perfect paddlepop skies say it all. Nice has by far captured my heart the most in my six months around Europe. It was the beach that captivated my heart. Before I set my sights on the beach, I never knew how therapeutic the sea had on my bearings. Where is Nice, France located? The mediterranean town is situated along the French Riviera, and the city known for its unique and beautiful beaches where you can spend the whole day at. It is also the city where the Nicoise salad originated from, in case you hadn’t drawn the link. I was also extremely fortunate to have witnessed the tail end of the Mardi Gras festival and witnessed fireworks on the off-chance that I headed out to meet Bryce, my couchsurfing host, to collect a couple of items I left at his place. 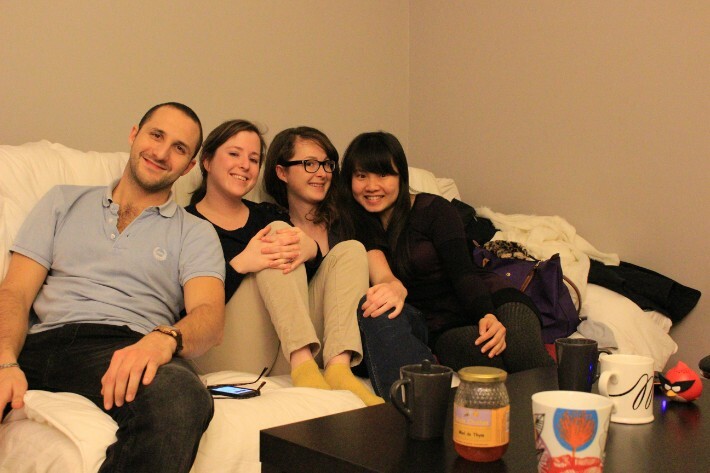 It was the first time I encountered an unpleasant experience through couchsurfing. An experience I’ll never forget, but much milder in comparison to what I experienced when I couchsurfed again with a solo male on my next destination in Cannes. I digress. 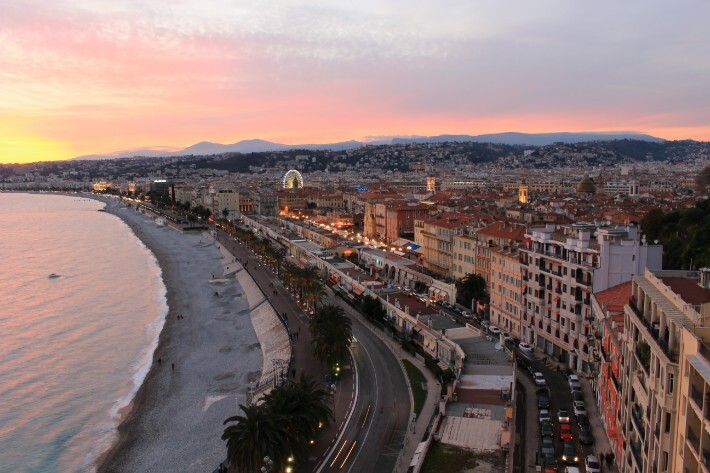 In any case, to answer your pressing question on what to do in Nice, France? Read on to find out more. The Promenade des Anglais is a 4km stretch of pavement that runs along the Baie des Anges. Here, you can find the beach everyone comes here for – the beach made of pebbles, instead of sand. I liked it a lot as sand won’t go into your shoes! But it isn’t necessarily the most comfortable beach to lounge on. Oh, when you listen to the sound of pebbles made by the flapping of waves, it’s music to my ears. I even recorded it down for myself to remember. Some interesting finds on a beach- an artist working up a drawing of Castle Hill, a girl reading, a guy having his picnic by the beach. 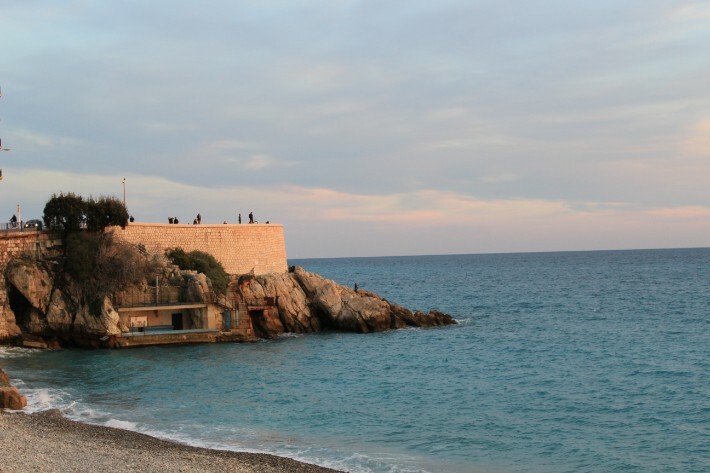 As its name suggests, the Castle Hill is situated atop a hill overlooking Nice Old Town. This is where you should go for stunning views of Nice city, the Bay of Angels, the harbour and the mountains. There are also elevators available for those who prefer not to break out a sweat climbing up to the viewpoint. The Old Town of Nice makes for good pictures because of the narrow cobblestone pathways and pastel coloured buildings. While exploring Old Town, do drop by these places for an authentic Nice experience. Place Rossetti – the heart of Old Town where you can get a good view of the Cathedral Sainte Reparate. It is the oldest and most ornate church out of the 8 churches in Old Town. There are also plenty of ice cream shops located here. Palais de Justice – one of the oldest surviving buildings in Nice and is now a museum. 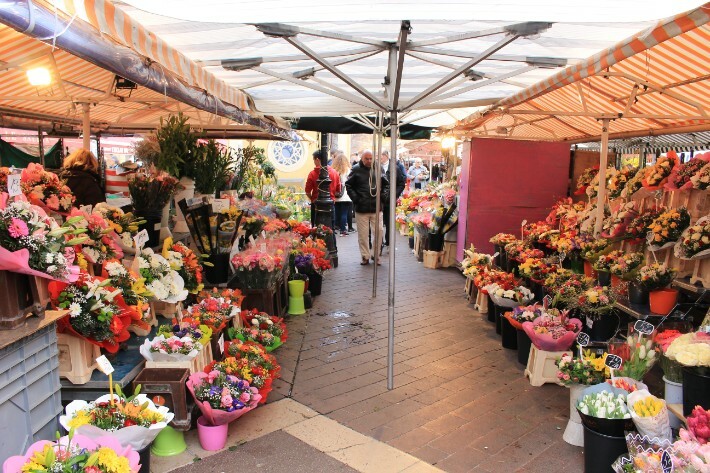 Cours Saleya is a famous market and flower market in Nice. 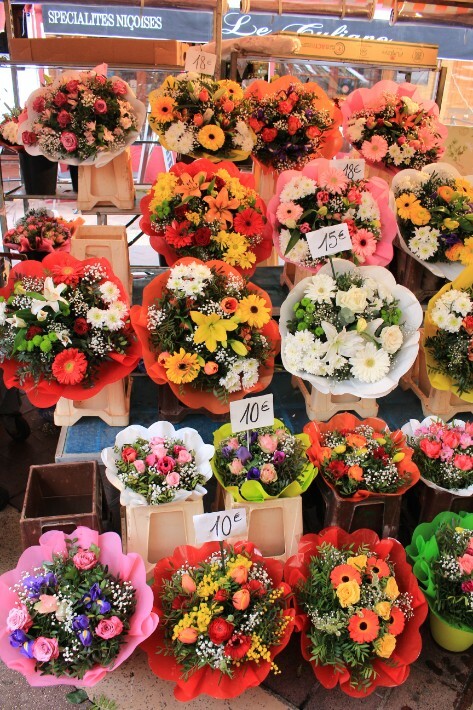 Buying flowers are commonplace here as it is rather affordable. They have such lovely, vibrant colours. It makes the atmosphere of buying & haggling fill with light-heartedness. The market is open daily, except on Mondays, where Cours Saleya would transform into a big, open-air flea market. An icon in Nice. By day, it has pink roofs and white walls. By night, it lights up like a castle, shining bright in its majesty. It’s difficult to pass this by without noticing how it stands out. It is built by the same guy who built the Eiffel Tower, Gustave Eiffel. The Matisse Museum is a museum dedicated to French artist, Henry Matisse. It houses the world’s largest collection of his works, tracing the evolution of style in his art works. 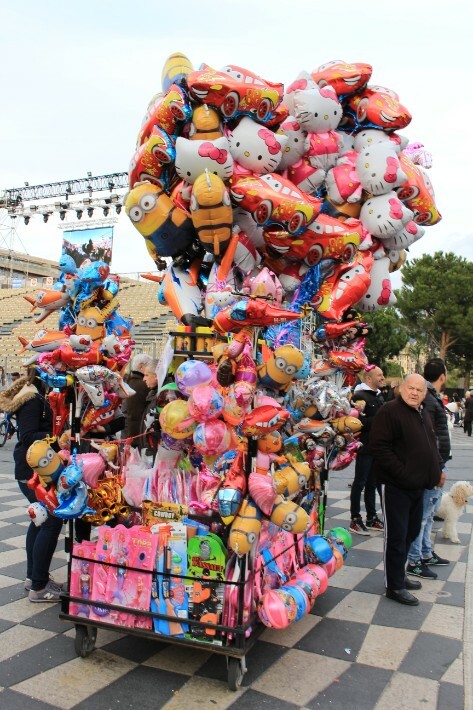 Nice Carnival is a major event on the Côte d’Azur (French Riveria in English) in winter. The carnival processions, comprising 18 floats work their way up to a crescendo of gigantic decorations on the Place Masséna. Floats are decorated with the most stunning floral compositions, extravagantly dressed characters throw out mimosas, gerberas, and lilies into the publics. For over 15 days from 13 Feb to 1 Mar, the city hums to the rhythm for this festival. I wasn’t able to coincide my travels with the Nice Carnival, but I was extremely fortunate to be able to witness the tail end of Mardi Gras. Mardi gras (Shrove Tuesday) never falls on a set date, although it is always a Tuesday, as its name indicates. The day depends on the date of Easter, and is set exactly 47 days before that date. It is a traditional time of entertainment and forgetting about life’s worries before the strict Lent period begins, and there are Mardi gras carnivals throughout the whole of France. People are dressed in all sorts of costumes to prepare for the entertaining night. I sneaked a photo of one of the most bizarre-dressed locals below. What’s a trip to Nice without trying the Nicoise salad? After all, this dish originated from this very city! For those who haven’t heard of the Nicoise salad, it is usually made of tomatoes, hard-boiled eggs, Niçoise olives, anchovies, and dressed with olive oil. This is Nice’s famous Fenocchio ice-cream. After the first day, I came back every single day the entire time I was here (which was only 3 days, in fact) to taste the myriad of flavours they offered. For €2, it is small enough for your cravings to be satisfied but not too much to be guilt-ridden. 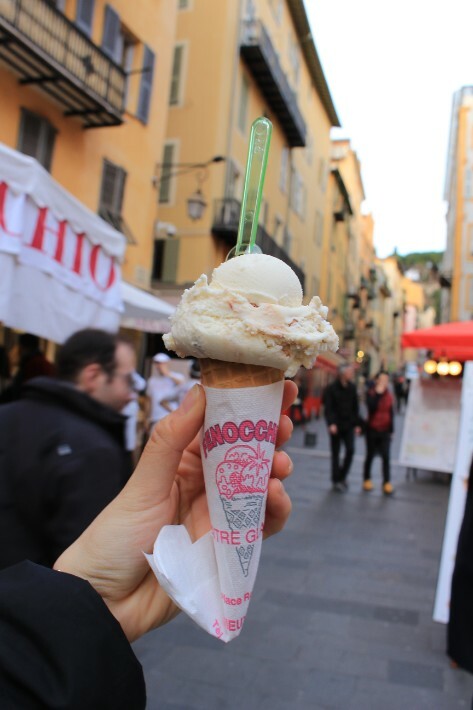 There are so many ice cream stalls in Old Town that you’re spoilt for choice, with prices starting from €2. This was my pick because of the recommendation of a local. Fenochio has over 20 different flavours, it’s such a headache to settle your tastebuds for one! Meet my friends from Ecuador. 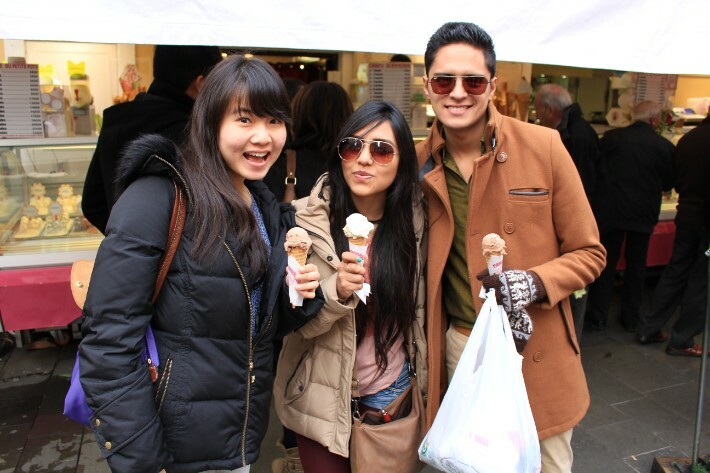 I brought them to eat ice cream after our day tour to Monaco. Teehee. Socca is thin, crusty chickpea pancake with a soft interior. It is one of the most famous local specialties in Nice. I remember watching the Disney film Ratatouille, and being so curious about how this dish tastes as all the characters in the movie seemed to enjoy it so much. This dish actually originates from Nice too! Ratatouille is a vegetable stew made of tomatoes, onion, garlic, zucchini – great for all those who are health conscious. I also met some lovely people- an Italian, American and French on a house visit on my first night. The French girl, Doriane, treated us to some lovely Brittany crepes! This was another step that challenged my comfort zone for me. We returned back close to 2am, after some interesting conversations with them. Ending with the magnificent sunset from the French Rivieria. I conclude that sunsets take my breath away more than sunrises after my fair share of sunrises in London (at Duck & Waffles) and on the train from Cannes to Paris. 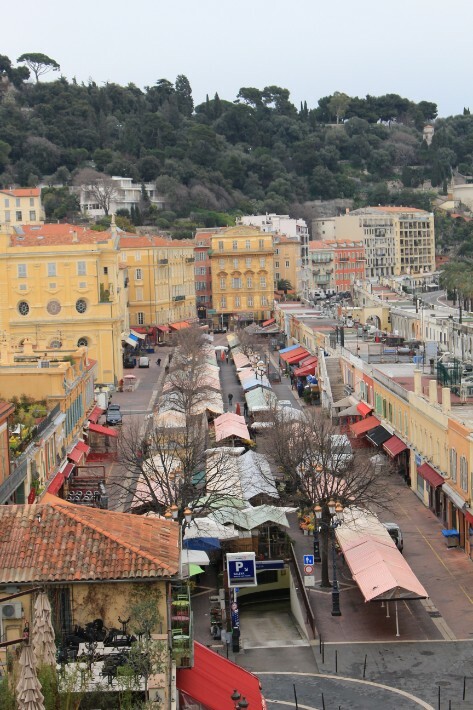 Nice has exceeded all my expectations because of the wonderful experience this quaint city has offered me. 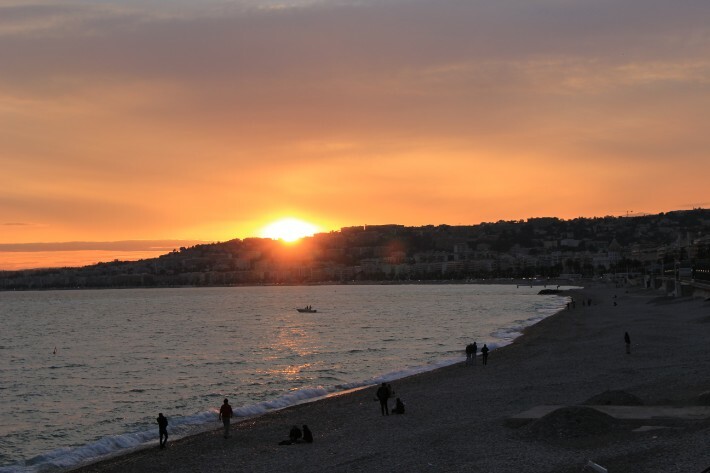 It would be a sin for me not to share with you the things to do in Nice, France.